The gut-wrenching stock market plunge Thursday reflected growing worries about a widening financial crisis in Europe spinning out of control. But the afternoon freefall was intensified by a modern electronic trading system that can move hundreds of millions of shares of stock at the speed of light. Hours after the plunge, there was no clear explanation for why the Dow Jones industrial average lost some 6 percent of its value in a matter of minutes and then recovered almost as quickly. The Dow ended with a loss of 346.51 points or 3.2 percent after its biggest intraday move in history. CNBC reported that the wild ride, which played out largely from 2:30 to 3 p.m. ET, might have been caused by human error when a trader hit B for "billion" in a trade instead of M for "million." CNBC said trading sources told it that the error may have happened at Citigroup. Citi said it had no evidence of a bad trade but was looking into the situation. 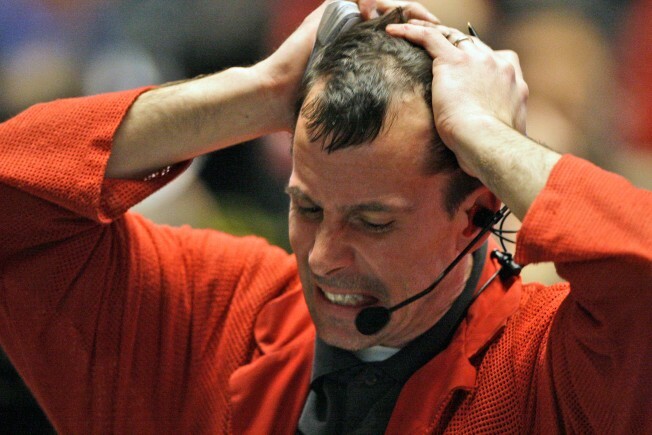 The Dow already was under pressure, down about 260 points, when the sudden sell-off began. Mounting tensions over Europe’s unsuccessful efforts to calm investor fears about Greece’s debt crisis were worsened by the latest pictures of riots in the streets of Athens. Those tensions were heightened by a vote in the Greek parliament to impose tough economic sanctions. Once the sell-off began, it was exacerbated by the same rocket fuel blamed for the 1987 crash: A series of program-driven trades that accelerated as the market continued its freefall. Program trading kicked in and kept rolling one because of trigger points, said Peter Costa, president of Empire Executions, who has 30 years of experience as a New York Stock Exchange broker. "Every trigger point they hit then hit another trigger point, and they kept selling, " Costa said. Much of the trading occurred off the New York Stock Exchange, leading some to question whether a human or technical error on one of the electronic exchanges may have been behind the plunge. The NYSE said there was no technical glitch. A spokesman for the New York Stock Exchange, Ray Pellecchia, said it has a pre-programmed “speed bump” that can slow down trades if there is a sudden, sharp plunge in a particular stock price, to determine whether there was an error. While that is happening, however, he said buyers and sellers can go to other markets to make trades, and it appears that is what happened here. “There was absolutely no issue on our end,” Pellecchia said. The so-called “hybrid exchange” — a series of electronic trading platforms wired together — has increased the volume of so-called “high frequency," rapid fire trading in recent years. That speed was reflected in the extreme volatility seen Thursday. The record plunge also reflected how computer-driven selling can accentuate a market panic, according to Costa. "They’ve written a lot of computer programs to buy but they haven’t written them well to sell," he said. “If the market is up, these programs do very well and it’s very orderly. ... They don’t know how to write something for the sell side." NYSE floor traders noted that the lows recorded on the floor of the exchange were higher — in some cases much higher — than those reflected on the hybrid market. Proctor and Gamble, for example, fell to just 56 on the NYSE but hit a low of 38 elsewhere, according to Art Cashin, head of floor operations at UBS. Human error or no, cooler heads prevailed as the computer selling began drying up and buyers stampeded back in. By the close, the market had recovered much of the losses incurred during the panic sell-off. The reversal may have calmed the markets in the short run. But the threat of a wider sell-off remains as confidence in the European banking system remains wobbly. Traders said it’s not clear where the market will find a new bottom. Only 173 stocks rose on the New York Stock Exchange Thursday while 3,002 fell. Volume came to an extremely heavy 2.57 billion shares. "I don’t think it’s going to be down to 7,000 but I think we’re still in a corrective phase," said Costa, referring to the Dow, which closed at 10,520.32. And the market has the crucial Labor Department employment report coming on Friday morning, which always has the potential to move markets. The employment report is expected to show payrolls grew for a second month in April.